When thinking about your wedding, many brides and grooms don’t think much about the wedding favours. While beautiful wedding favours can be purchased, it will always mean a lot more if wedding guests know that the couple made the favours with love and with them in mind. Even better is to give them a favour that they can take home and use instead of letting it sit on the shelf and gather dust. That said, where would someone start when it comes to making favours? Here are some easy ideas. These are the big new thing at parties, baby showers and weddings. You can make them yourself with cake mix and frosting, as well as some decorative items like sprinkles. You can make them your wedding colors, or you can decorate them like little bride and grooms. A delicious treat for every wedding guest! The plant that can keep on giving. You can decorate a clay pot that the herbs will grow in and this would be a great addition to anyone’s kitchen. You can even add a name stake into the plant and it can double as a place tag. If you have a lot of people coming in from out of town though, make sure you take into consideration the transportation of the plant. Gather bottles, olive oil, corks and some herbs and you can make your own olive oil. Guests will love this and it’s something practical that they can use. 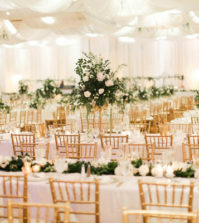 A week or two before your wedding, add your selected herbs to the bottle so that it has time to add flavour to the oil. Make sure to add a custom label on the bottle with your names and the date of your wedding for an added touch. All you’ll need is bakers chocolate, plastic spoons, bags and ribbon. Melt the chocolate and dip the spoon in it; place on wax paper to cool. 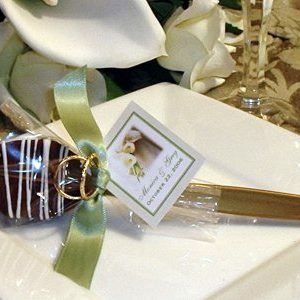 Once cool, package the spoon and tie with a ribbon that represents your wedding colors. Make sure to also add a tag with your names and wedding date. You can also package the spoon with two mini marshmallows and a package of hot chocolate for a hot drink treat.